When designing the custom home of your dreams, it is often easy to overlook the absolute necessity of practicality. 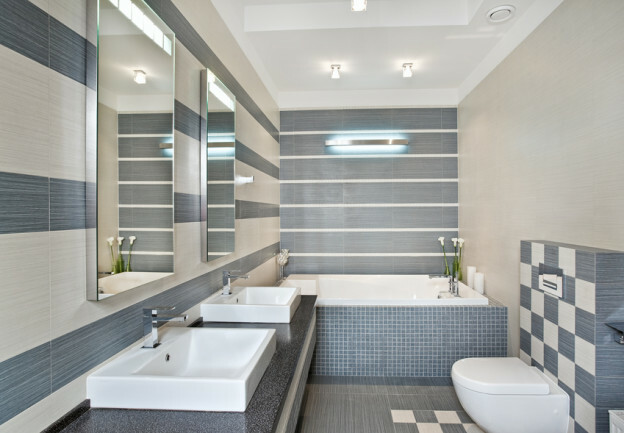 You may be so overwhelmed with aesthetic ideas that you forget to include important features that will make your home all the more livable for you and your family. Listed below are several tips and tricks that will greatly help to improve the comfort and practicality of your home, while maintaining the visual ideas you have likely grown extremely attached to. Including a second sink in the kitchen, preferably a full-sized sink, will allow for you to thaw out the turkey while washing the gravy dish, to bathe the baby while soaking the pots, and to move dirty dishes one at a time from the “used pile”, assuring you have plenty of arm room to properly scrub each plate clean. There are many benefits to installing a second sink, do it yourself to discover your own! Installing magnetic door switches will prompt lights to turn on when a door is opened. These are especially great for walk-in closets! All too often, you may find the bathroom door unable to fully open due to that sneaky pile of clothing shed before a shower and conveniently forgotten about. Installing a dirty laundry basket underneath the bathroom sink or inside of the closet door can do wonders to help keep the floors clean! Rather than dragging a chair across the kitchen floor every time you need to grab the oregano from the top cabinet shelf, install a walk in pantry complete with sliding footstool or ladder. This is a great special move, and will allow for an extremely ideal hide-and-seek opportunity as well. This one speaks for itself – how often have you been all but falling asleep while reading your nighttime novel, only to have to stand up and walk all the way to the bedroom door?! Convenience is key with this smart and practical design tip. Not only are valet rods spatially ideal, allowing for much more storage even in limited closet space, but valet rods are inexpensive to install. Add narrow shelves in closets to store your shoes vertically. Shoes can add unnecessary clutter to closets when strewn about the floor. Also, add a small shoe rack by the front door for guests to store wet or dirty shoes upon. This will save major space and time – simply install a fold-out ironing board into a dresser drawer or a storage drawer in your closet. This is more than a comfort than a practicality – but who doesn’t like stepping out of the shower onto a warm floor? Radiant heating makes the winters more bearable. Considering the fact that most exit and enter the laundry room with an arm full of clothing, swinging laundry doors are extremely practical and useful. Placing outlets under cabinets rather than on the walls will allow for tiling, making the kitchen more cohesive and aesthetically pleasing. These are only a few of the numerous practicality tips and tricks you can employ to make your custom designed home more livable. For even more ideas, stay tuned for future installments!